The first thing I have to say about this beer is that the moment I popped it open, all I smelled were hops. Keep in mind, I didn’t have my face right in the beer. My nose was a good two or three feet away from the can when I opened it. And I mean, the actual physical hops. Like when you go on the Sam Adams brewery tour and they make you rub hops between your hands so your hands smell like hops for the rest of the day. Like that. Not hoppy or essence of hops. I still haven’t even tried it. It’s..astonishing. I don’t even know if I want to try it. I love their can art though. Is that a term? A real term? Can art? I prefer the art on Stranger than Fiction, their porter, but this just pops. According to Collective Arts’s website, they use their beer to promote artists and muscians, so that’s pretty cool. I waved the beer at my wife and she said it smells like a brewery floor. It smells like its calmed down a bit, much more muted, more tame. Before it was a hops djinn that had been released from some thousand year slumber. Now it’s…an IPA. Whoa, that’s pretty pleasant actually. Not aggressively bitter, it’s not one of those craft beers going for the IBUs. 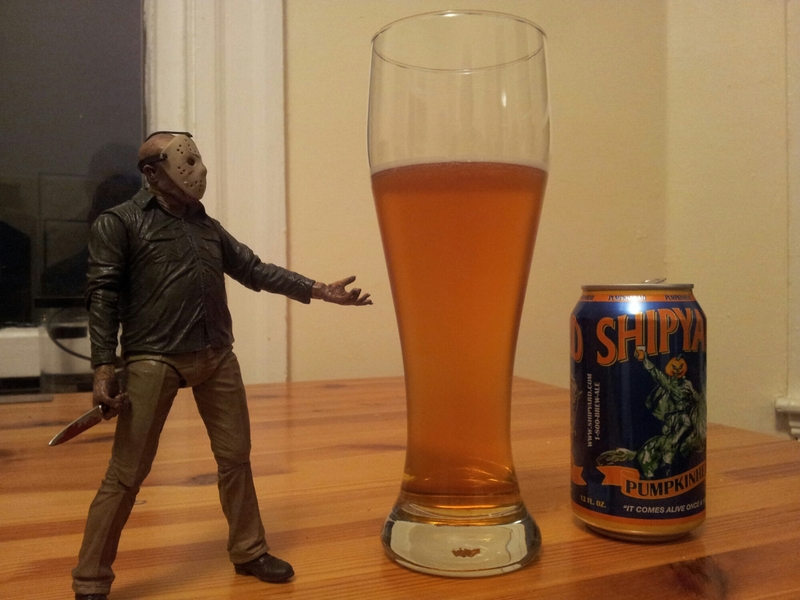 It’s…a really good, really solid IPA. It’s a little sweet, barely any back-of-the-throat bitterness biting at you. I don’t think I’ve had such a positive turnaround on a beer from beginning to end. If you like IPAs, but you’re sick of some bearded, flannel wearer cramming bitterness down your throat like a craft beers are a contest to see who can get the highest IBUs, definitely try this out. Little sweet, very solid and a strong IPA. I give it six happy, floaty clouds. CORRECTION: It’s a double IPA, so at 8%, it might put you down, if you’re not used to that. For a long time, I had a love/hate relationship with IPAs. They were too bitter, too strong tasting, too hoppy. Now I feel like I could go the rest of my life never drinking anything else. So when I saw a new Sam Adams Double IPA, (Third Voyage) I ran and grabbed my specially designed, high tech Sam Adams guzzlin’ glass and filled it to the brim with hoppy. And I’m underwhelmed. I’m never happy with an ordinary IPA. I want to be sandblasted with flavor. I want to have trouble finishing the whole glass because the flavor is punching me in the uvula with a ferocity that could only be equaled by Jake LaMotta roid ragin’. I want my taste buds to be knocked out so hard that the only thing they’ll be able to handle is watered down PBR. The problem with Third Voyage is that it’s too….nice. There’s no bold flavor at the front and there’s no bold flavor at the back. It’s smooth, almost downright mellow and it’s ticking me off. It hits all the right notes, but not with the right intensity. It has a sharp bark, but no bite. It has that bitter finisher, but not that throat puckering grab that some IPAs have. It’s a perfectly good Double IPA, sweet and grapey and strong, but it’s just not the IPA for me. I recommend it if you’re not into ultra-hoppy IPAs like Harpoon’s Rye Ipa. I give it half a hop and a skip.